Find out how Curtis Jackson turned his success in music into the Starz hit TV show "Power." 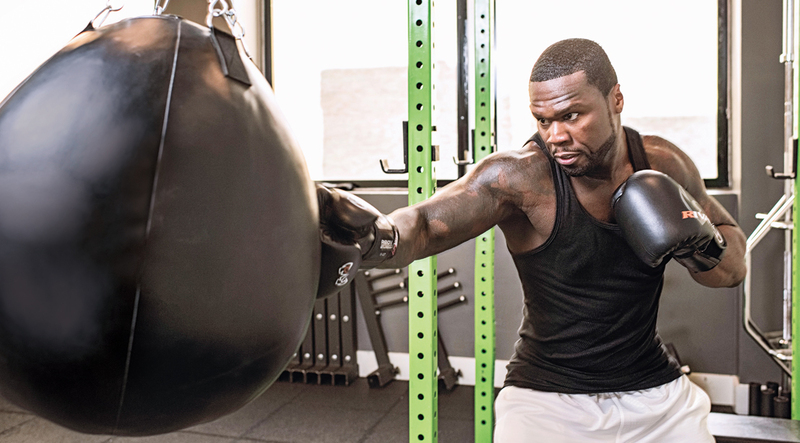 Curtis "50 Cent" Jackson is standing shirtless in a fighting stance, wearing a pair of rare gold boxing gloves signed by the late boxing icon Muhammad Ali. The image does more than demonstrate 50’s love of the sweet science— it symbolizes the fight he put forth to escape poverty and crime to become a power player in both music and media. Now 41, Jackson still raps—he’s also an entrepreneur, investor, and actor and producer in both TV and film. Work on the fourth season of the Starz original series Power, on which 50 has a reoccurring role and is an executive producer, has kept him busy lately, but so have other greenlit projects: a variety show titled 50 Cent Presents and a scripted superhero-themed series, Tomorrow Today. While we had 50 sitting still we talked about training, Power’s “invisibility,” and why he turned down a role in The Expendables.